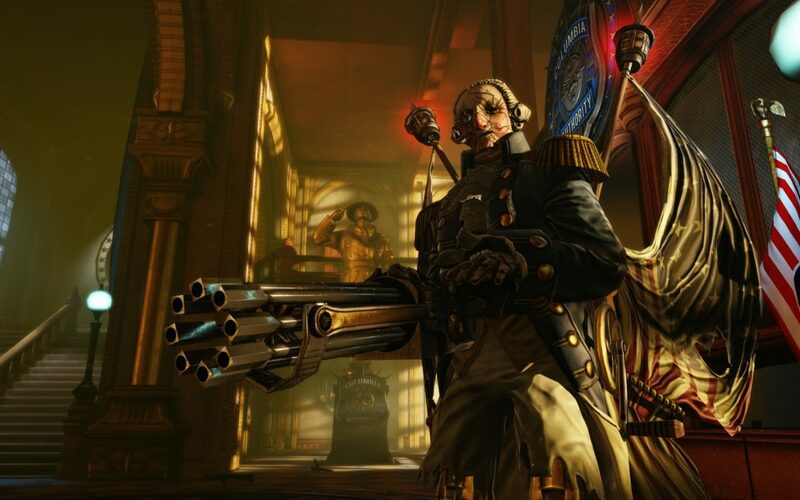 Bioshock Infinite is a masterpiece with serious flaws. There, got that part out of the way. Now let’s talk about what it tried to promote. While the first Bioshock tackled everyone having full control over their lives—especially regarding economics and how capitalism plays into it–the sequel Bioshock 2 did the same treatment for communism. Showing the evils of the opposite of the spectrum. The problem, it seems, is we live in a world where there is no set answer to these kinds of questions. No matter which extreme you choose. But later, after a while, the next game came into existence, and instead of hitting hard at another opposing ideology, it went a tad more…topical. In other words: it is a floating sky city populated by white supremacists who all worship a born again “prophetic” religious leader named Comstock. That alone is a lot to unpack, and this article is not long enough for me to go into the serious social discussions these games deserve. But, perhaps, the biggest takeaway from all the games is this idea: Charismatic pseudo-dictators are never good. Letting a single person control everything is never smart. And this applies to this day and age. Whether on the country’s stage or just here in Clearwater. We all focus on the president, but we need to look at all the people in charge. The president has power, sure, I am not even going to attempt to argue, but he does not have all the power—and no one should, really. No one should have all the say. We have a lot, a lot, of elected officials all over the place who can help create compromise, and we must compromise with other’s beliefs. And failure to understand that will not end well. Seceding from those you disagree with will not end well. And if you don’t believe me, well, give it about thirty or so hours of gameplay, and I think you’ll see my point. Good satire can promote, implant, and imply ideas without saying them. And I am excited to see if, and when, more video games go the extra mile to hit on such broad and thoughtful topics as this. Movies and books and plays already do and did: but now we can directly interact with the ideas presented. And that is real power.